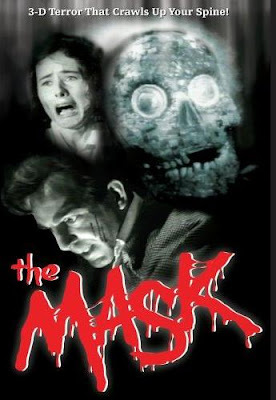 Definitely a cult movie, early Canadian horror The Mask is finally out on DVD. In 3D! I was going to include this in the Not On DVD movies. But after another viewing, I couldn't recommend it as a must-see. 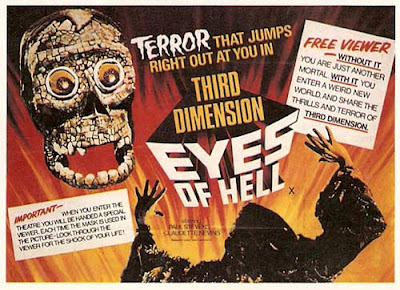 It's a cheap, dull story for the most part, only the 3D 'dream sequences' are really worth seeing. Really very good 3D effects and wild, horrific imagery, presumably shot by a different director. The 3D benefits from long tracking shots. I still think that the best 3D effects allow the viewer to 'get their bearings', like a camera moving through a deep hallway of cobwebs. 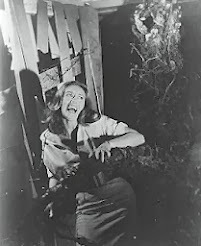 The set designs and make-up effects are uniquely nightmarish and the shocks are carefully designed for 3D. A giant Aztec skull floating over a sacrificial ritual, a phantom firing fireballs from its palms, druids with razor-gloves... 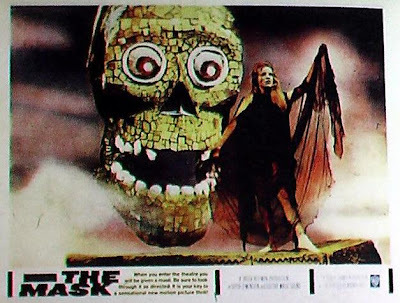 The stills you see from The Mask are always from these scenes, which tell their own dream-logic story. Joined together, they would make a far more famous 3D short film. 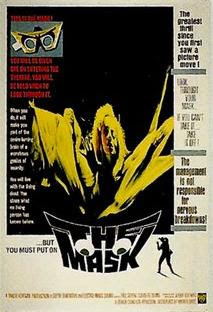 The DVD is from Cheezy Flicks. 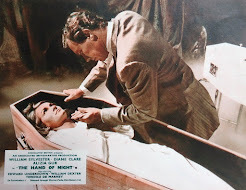 It's a black and white fullscreen movie (this lobby card was hand-coloured). It's misleadingly listed as colour, because it's presented in the red/green 3D process. 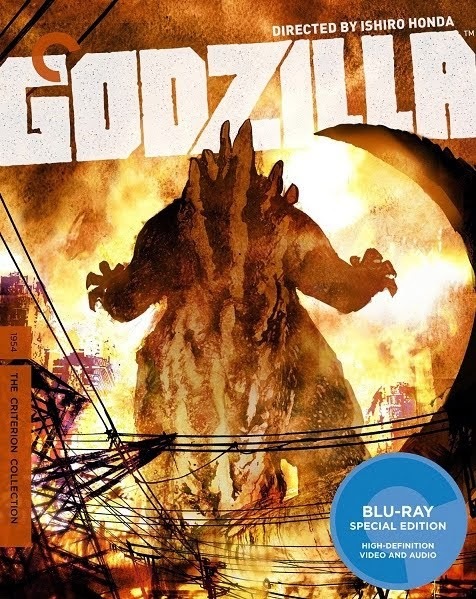 From the reviews, it doesn't appear to have been digitally remastered. "Put the mask on, now..."